My Assassin’s Creed Origins demo began with the protagonist Bayek talking to his wife, Aya. The two are both loyal to their queen, Cleopatra, but this devotion seems to have caused a rift between the two. Bayek is worried that they never have time to spend together, and that she values the queen more than him. 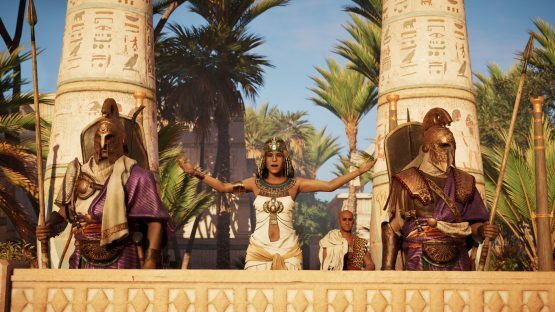 “What has she done for you that I have not?” asks Bayek, despite knowing deep down that his questioning wouldn’t have any real impact on her conviction. The reason they’re together today is to investigate a sick Apis, a bull that’s worshipped in the Memphis region of Egypt. The sacred animal is recognized as the son of Hathor, the Egyptian goddess that personified motherhood, and was periodically sacrificed and reborn in order to worship her. So, this is not a mere sickly animal, but an investigation of a deity. As such, it was important that I figured out what was going on. The quick investigation had me wandering around the bull’s living quarters, and I quickly found out the culprit. The animal had become sick by eating peach pits, which are poisonous when ingested. This wasn’t a mistake, as it had been fed several, and Bayek then questioned the twin priestesses that feed the sacred animal. They quickly confess to the crime, but say that they were doing so out of blackmail. Their only brother was taken hostage, and they had to kill Apis if they wanted him to be released. Since Bayek is an Assassin, there was no way that he was going to abide by rules set by a blackmailing criminal. That meant that I was now on a quest to rescue the brother. This led to me infiltrating a nearby building that was filled with guards. I decided to gain the high ground by climbing up, and attempted to use my bow and arrow to take out a few of the baddies silently. Despite my best attempts at being stealthy, I ended up getting spotted pretty early on (it turns out I’m not quite the shot with a bow and arrow as I thought I was). This led to my first melee combat exchange, a system that has been completely rebuilt for Origins. All of the canned animations are now gone, and as a result is a much more fluid system. While I was able to slice my way through a few guards, I quickly became overwhelmed. When my health reached a low point, I decided it was time to momentarily flee. After climbing a few walls, I was able to hide for a bit. This let my health regenerate some, and the previous chaos had the guards out of position. I quickly made my way to the brother, who had been injured by his kidnappers (he even lost a few fingers), sliced a few guards, and then it was my job to carry him back to his sisters. I had to be careful when escaping, since I wasn’t able to climb walls with a fully grown man on my back, but I was able to avoid combat, and made my way back unscathed. It looked like it would be a happy ending for everyone involved, but once Cleopatra was informed about the twins poisoning the sacred bull she ordered their deaths. Aya quickly explained that they were being blackmailed, and it turned out that the blackmailer was a high profile Egyptian. It was just a hint of all of the political espionage that the game will likely deal with, and I loved having a front row seat to all of the drama. The demo ended there, but I want to touch on just how beautiful Assassin’s Creed Origins looks. 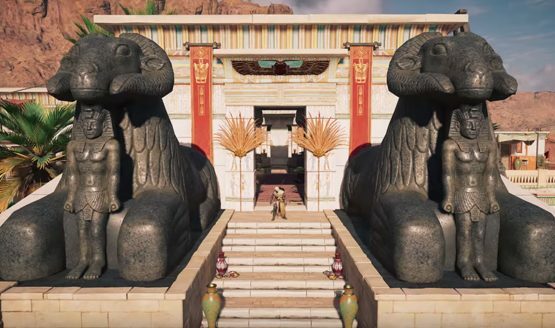 This is not only due to the gorgeous Egyptian setting, which features a natural beauty in its architecture, but also due to Ubisoft creating a wonderful living world. From rowing a boat to walking through the city of Memphis, I was constantly wowed by what I was looking at. It’s one of the most gorgeous games I’ve played, and really shined in 4K. Historically, I’ve never been the biggest Assassin’s Creed fan (I do love Black Flag, though). Despite this, Origins seems to be fixing a lot of the issues I’ve had with the games in the past (including clunky combat). Thanks to its gorgeous setting, I’m looking forward to seeing how its story of ancient politics will unravel when it releases October 27, 2017. Assassin’s Creed Origins preview conducted at PAX West 2017. Played on an Xbox One X.